Originally from Thanjavur, she was named Kalaivani by her parents. She adopted the stage name ‘Lady Kash’ for her rapping avatar. Eighteen-year-old Lady Kash was rather surprised when she got a call from playback singer Benny Dayal saying AR Rahman wanted to meet her. She promptly hung up on him dismissing it as a prank call. It took a second call to convince her that AR Rahman had indeed requested a meeting with her after seeing some of her independent singles online. After the successful meeting, Lady Kash was catapulted to success with her debut song in superstar Rajinikanth’s film Enthiran. Lady Kash is a self-made bilingual rapper who was born and brought up in Singapore. Originally from Thanjavur in Tamil Nadu, she was named Kalaivani by her parents. She adopted the stage name ‘Lady Kash’ for her rapping avatar. “I moved to India from Singapore when I was 18 to pursue a diploma in Recording Arts. My parents were very reluctant about the idea. They didn’t think of rapping as much of a career. But I was sure that was it. I wanted to become a rap artiste and a creative professional and finally they conceded,” she says. “Convincing my parents was no mean task. I made my father promise me that if I managed to contribute half of my education expenses in India, he would let me go. And luckily, at that time there was an online talent competition with a large sum of prize money. After beating 8,000 contestants from different countries, I won the show and there was no stopping my journey to India,” she says. Since then, her musical journey has taken her around the world to countries like Canada, Switzerland, Dubai, Sri Lanka, Malaysia, to name a few. Lady Kash’s strong appeal towards rapping stems from her love for freedom. “I have always been a free spirit. Freedom was very important to me. And living in Singapore which was a highly rule-bound society, I was naturally drawn to this art form. It offered me the freedom society didn’t offer,” she says. During her childhood, Lady Kash excelled at poetry, writing and arts. And soon she realised that she was naturally drawn to rhythm more than melody. All these came together in the form of rap for her. While Lady Kash admits she is not very religious, she is very much attuned to her spiritual side. Music and spirituality go hand in hand for this young musician and she believes the universe has a way of getting things done. True to her words, she says ‘Lady Kash’ was a name that just appeared to her in her dream and she knew she had to adopt it. Lady Kash’s journey to music hasn’t exactly been breezy. “Being a female rap artiste in a largely male dominated space came with its own challenges. I wasn’t taken seriously when I reached out to people asking for guidance. I had to rely entirely on myself to develop my skills. You wouldn’t believe the kind of things I have googled to figure this out. I have literally spent hours going through dictionaries to improve my vocabulary. Honestly, it took me a good 4 years to figure out my voice and rhythm and establish myself as a rap artiste,” she says. Lady Kash has recently had a breakthrough with her latest single Villupaattu, released independently through her label AKASHIK. What started as a journey of self-discovery into her musical roots has now resulted in her deep commitment and devotion to saving indigenous music forms. Her song Villupaattu is dedicated to Poongani amma, the oldest living villupaattu performer in the country. Lady Kash finds an undeniable connection between villupaattu and rapping. “They are both forms of musical storytelling. Much like rap, villupaattu has got a lot to do with stage persona and that element of style. I was devastated to see the art form dying. I believe if we don’t know where we come from, we wouldn’t know where we are going. And going back and finding my roots in such a hapless state has deeply disturbed me,” she says. 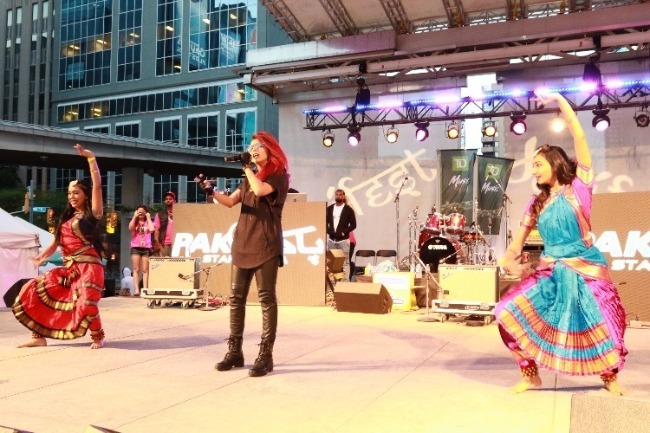 Lady Kash believes that rapping has its origins not just in the African and American continents, but was very much a part of the Indian musical landscape too. Lady Kash has plans to open a professional school for rapping. This is her way of ensuring that rap doesn’t meet the same fate as villupaattu. While Lady Kash is a strong advocate of preserving indigenous art forms, she also admits that music is ever-evolving and ever-changing. But it’s important that we don’t forget our roots.